We’re hugely delighted that J.C. Jones’ debut novel Run, Pip, Run has won the 2016 Readings Children’s Book Prize, and are extremely proud that it is our third win in the three years of the award following Trace Balla in 2015 and Julie Hunt in 2014. The Readings Children’s Book Prize recognises and celebrates Australian books that children love to read, and raises the profile of debut and on-the-rise Australian children’s book authors. From a shortlist of six, Run Pip Run won over the judges with its unique main character and exciting story that tackled big issues. Every once in a while a special book comes along with a unique main character so compelling and so full of heart that you can’t help but fall madly in love. Run, Pip, Run, the winner of this year’s Readings Children’s Book Prize, by debut author J.C. Jones, is just such a book. The story begins when, on the day of Pip’s tenth birthday, her carer, salt of the earth old Sully, has a stroke, destroying Pip’s birthday cake and getting himself an ambulance ride to hospital. Pip is worried about him but knows that with Sully in hospital she will be placed in welfare. Instead, Pip goes on the run. Pip is a brilliant character with nerves of steel and a heart of gold who will appeal to both boys and girls. Her action-packed journey through the streets of Sydney touches lightly on issues including homelessness, animal abuse, and predatory behaviour. But Pip’s unrelenting sense of optimism and resourceful attitude remind us that no challenge is insurmountable, even if you are only ten years old. There is a strong moral code in this fictional world and the reader is never made to feel that Pip is out of her depth. During her journey, she also finds supportive allies in a police officer, a school friend and a teacher. It’s a great achievement to take the story of a child in such difficult circumstances and turn it into an exciting, fast-paced, even humorous read. J.C. Jones has pulled off this formidable task with aplomb. Jones is an exciting new voice in children’s literature and we are delighted to champion her at the beginning of what we anticipate will be an exceptional career. Run, Pip, Run is a book that will be celebrated widely and live in our hearts for a long time to come. To say I am thrilled to be the recipient of the Readings Children’s Book Prize is the understatement of the year! The Readings Prize is about supporting the books that children love to read – and that families enjoy reading together. That’s what makes it particularly special to me. And, of course, emerging writers need every scrap of encouragement they can get! I’m also delighted for my wonderful publisher, Allen & Unwin, who have provided immense encouragement throughout and who share the same passion for children’s books as Readings. When I wrote the book, it wasn’t meant to be about issues at all. It was just meant to be the adventures of a stubborn, prickly ten-year-old called Pip, who is determined to do things her way. There was definitely no conscious intention to comment on social issues! It wasn’t until my publisher read it and commented on this aspect that I really thought about it. Perhaps this is why it didn’t appear heavy-handed – because it wasn’t even deliberate! It was just Pip’s story. I emailed a synopsis and a sample chapter to Allen & Unwin as part of their Friday Pitch, where they look at unsolicited manuscripts from authors. This really suited me as I have no verbal skills, so I’d never convince anyone I had a good story by phoning them and talking about it! Then Anna McFarlane, a publisher from Allen & Unwin, emailed me back. I didn’t read it for a few days because I was certain it was a rejection and I wanted to put it off for as long as possible! So it was a nice surprise when I did read it and she wanted to see more. I had a rough first draft so I spent a few weeks polishing it up, sent it to her and the rest is history. 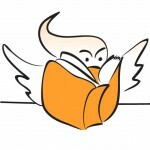 Learn more in this great Q&A with J.C. Jones on the Readings website, where you can also read their post “Five Reasons we love Run, Pip, Run” as well as their announcement and judges comments. Hooray! 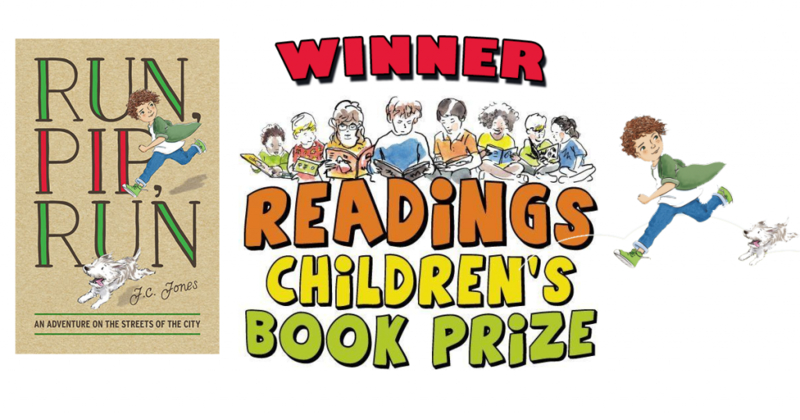 #RunPipRun has won the @readingsbooks Children’s Book Prize!